This guide is intended to show the entire process of how a customer places an order, and how you will receive and manage that order. Once the customer has added an item to the cart, and is ready to pay for the item, they will hit the checkout button as seen on the right hand side. The customer will now need to fill out the billing information. You will then be asked to fill out the same information again for shipping, however if the information is to remain the same for both billing and shipping, then as seen on the image, you can just tick “ship to this address”. This stage is straightforward, because there will only be on option for shipping setup on each website. The customer can also leave a note but then can click continue to proceed to the next stage. Read here how to setup shipping settings. This customer here will have the option of paying with PayPal, or Sagepay or alternative payment merchants, if only one option is available, then there will be no option, simply a message stating so, the customer can also then leave a note on the order. See here how to setup payment methods. Also at this stage a coupon code can be applied to reduce the overall cost of the order. See how to setup coupons here. This here will be a summary of the order. Once you click confirm order then you will be redirected to an SSL secure page, hosted by your payment merchant, see the next step for an example for PayPal. 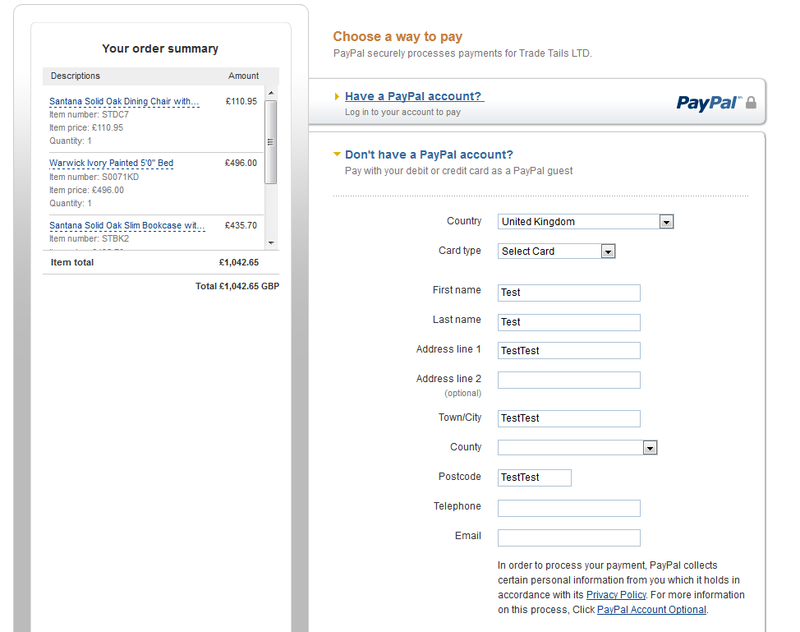 In our example, you can then see how the order has been processed via PayPal. Here you can either login to an existing PayPal account, which nowadays majority of people will have therefore making the payment far easier for the customer. The alternative is they can fill out all details as you would usually expect on a standard shopping cart, and then opt to pay as a guest. Once the payment is made, PayPal will redirect the customer back to the website, an email will be sent to both the customer and the administrative contact of the website to confirm the order has been placed. First of all if you ever receive an order – you will get an email to let you know about it however we advise logging into your website on a regular basis to check orders regardless. Pending means that the submit button has been pressed (stage 6) on the order review for the customer; however when going to enter payment details (Stage 7) the order has not been placed, the card details were not entered or the order is incomplete. This is a hot lead, contact the customer immediately to find out why they didn’t or could not pay. Here we have the order overview, with five options. Print Order – This doesn’t print the order however it does create a PDF invoice/receipt for you to download. A very useful tool for saving time manually creating invoices. View Order – Displays a more in-depth order review. Displays everything from transaction history to any add-ons used. Create Invoice – This creates the sale in the invoices module which we will come onto next. Once the sale is confirmed, use this button here. Edit Order – Pretty much as it says on the tin. Delete Order – Again, we would advise against deleting anything. You can update the status of the order, and have an automatic email sent out to the customer also to update them on the status of the order. This is good for notifying if the order has been delivered or of any tracking number when the goods are dispatched.